It is with great pleasure and honor to create the write-up for Joe Ruminski’s demonstration of 12/15/2018. The pleasure is due to his great delivery, dedication to educate and valuable information imparted to us all. The honor is due to him being my first mentor (2010), along with John Roller. Patience and clarity along with tips and “show how” were all that was needed to addict me into the fun of woodturning. Thank you, Joe. 1. Sharp tools. Whenever you are experiencing a problem with your cuts or your sanding seems endless, first go back to the grinder. Joe sharpens about every 10 minutes during a normal turning session. 2. Light and slow cuts (with speed up) will minimize tear out and rough cuts. 3. Turn what you like. Size does not matter. 4. Joe finds that an expansion recess, rather then compression tenons, hold better. 5. To avoid tear out when hollowing a bowl form, round off the back portion of your bowl gouge bevel. 6. It is a matter of preference…Joe uses a fingernail grind with straight sides, rather then an Irish grind. 7. Determine where your cut is to end so that you start your cut in an uncomfortable position, ending your cut in a more balanced and comfortable position. 8. When hollowing a bowl form, first position your gouge with the bevel at 90 degrees to the rim with the flute at “3”. Once your cut starts, rotate the bevel to, say, “2” and softly and slowly ride the bevel along the inside curve. 9. To avoid holes where the live center point compresses at the bottom of a piece, use a scrap tester block between your live center point and your piece being turned. 10. You get a better cut with a push. Finish off with a very light shear slice. 11. When hollowing the last 1/3 of the bowl form, do not push your gouge across to center with the front hand. Allow your bevel to slowly and lightly be pushed with the back hand across the bottom contour. 12. For a deep (say 6”) and large (say 15” diam.) bowl, use a 75 degree conventional grind with a rounded bevel. 13. Always bring your tailstock up, when practicable, for safety. 14. Always cut on the bottom/side, and the tip of your gouge. The top side is used very seldom. Mount a dry block of wood, center to center and round off. Create a recess for expansion hold with a 2 1/8” forstner bit (this may change depending on the size of your design). Using a #2 straight jaw, fasten and bring up your tailstock for safety. Shape to your desired design and finish outside with a shear cut. Hollow out a recess for the intended rings. Start your hollowing cut with the front bevel at 90 degrees from the rim and flute at “3”. Once the cut starts and there is a small recess, rotate flute to approximately “1-2”, hollowing to the depth of your design choice. Sand to a minimum of 220 or your preferred level of grit. Create a jam chuck to reverse and clean up the bottom. You can use a slightly concave and padded jam, bringing up your tailstock to “jam”, cleaning up the bottom. Take off and chisel and sand off the bottom center. Follow instructions above until your outside (less the hollowing) is complete (but assure you are using a rounded piece at least 3” in dia. Dismount and create a second (offset) recess with your 2 1/8” forstner bit. This recess will go deeper then your first (centered) recess so it will hold. Mount the piece using the offset recess you just created. Create your hollow for the intended rings (remember when offset turning to slow your speed down and make sure you test the clearance of the piece to your tool rest. Keep your hands behind the tool rest at all times). Follow the remaining hollow instructions for the first ring bowl, above. Center to center and round. Push cut rounding off bottom facing tailstock. Create tenon on both ends. Mount on jaws and shape to your desired design. Using the Golden Rule (approximately 2/3:1/3”) mark off where you will be separating the base from the top. Begin parting with the larger (7/32” +-) parting tool but not to separation, stopping at your desired diameter of the inside tenon which will be securing the lid when complete. Then using your thinner (1/8”) parting tool complete separation but position your narrower parting tool so it leaves a slight tenon on the inside of the top. This will give you the exact diameter for your inner recess where the top fits to the bottom inside tenon. Now that the top is parted, hollow out the bottom, but keeping clear of the inner tenon created with the parting tool. To hollow, Start as if you were making a traditional bowl using your bowl gouge. Then cut the recess of the top with a square box tool. Before taking the bottom off the chuck, assure the tenon is parallel to the outside. Mount the top in your chuck using the tenon you first created. Using the mark left from your separation process and using a box scraper, cut down the inside of the top to fit the tenon on the inside bottom. Keep your fit on the looser side because a pop top will warp and you will not be able to separate but a couple of times a year! Slightly hollow out inside of top to your desire. Re-chuck bottom. Place top on same and maintain a slightly loose fit. Use masking tape to secure both pieces, finish off the outside of the top. (using your tailstock at the beginning of this process to assure the top will not fly off). When you finished the top as much as you can without removing the tailstock, then remove tailstock and with your cutting always going towards the headstock and with very light and slow cuts, finish off the outside of the top to your desired design. Bring tailstock back (removing the tape) and with a small scrap block, protect the top from the pin in your revolving center. Now use a pointer tool to create accent lines on both sides of the seam where to top meets the bottom. Take piece out of chuck, create a jam and reverse the bottom to clean it up. Use your tailstock for most of this process. Mark off goblet size and stem length (keeping Golden Rule in mind). Create recess with your forstner bit. Create the rim of the goblet. 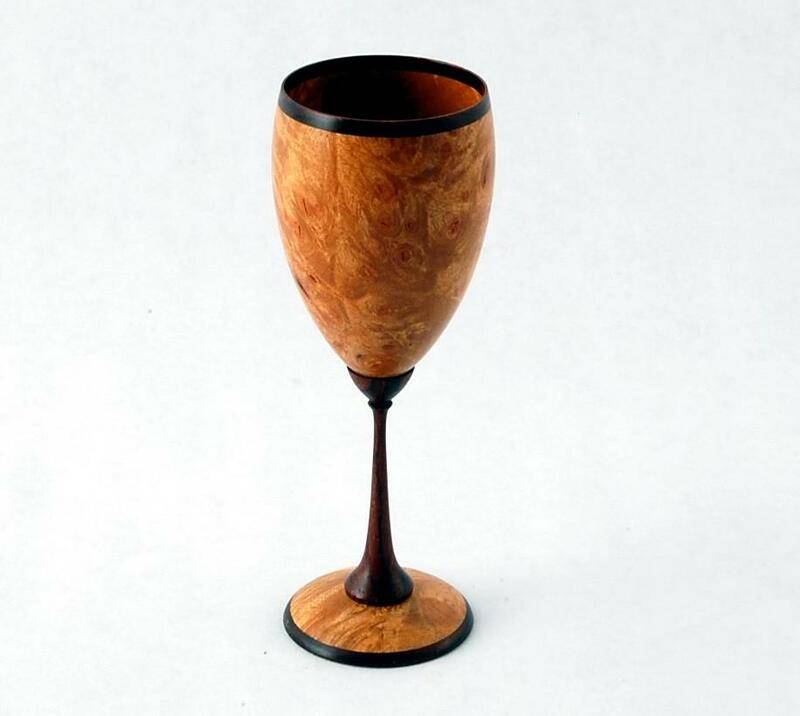 Use spindle gouge (pull cut as described in the above project) to hollow out goblet and then shape outside of goblet. After working the shape of the bowl portion of the goblet down to the intended beginning of the stem, start shaping stem (always cut at the side near the top, using the side of your gouge). As you process the thinning of the stem, vibration will occur. So, try using the live center cone attached to your revolving center and with a gently tightening, begin shaping your stem in stages, thinning until your desired thinness at say 1/2” increments, working your way down to the bottom of the stem where it will be meeting the base. Your base should be approximately the same widest diameter of your goblet. Create some design lip or “V” type shapes where the bottom of the stem meets the base. First create a centered recess with your forstner bit. This will be used to create the outside form and rim. Also create two screw chuck holes as offsets. Using your own design, pick there two points using a compass to establish where your offset embellishments will lie on the finished face of your project. This requires a bit of trial and error with your compass. A 3/8” drill bit fits the Oneway screw but please check for the appropriate size drill if your screw chuck is different. Using your center recess, shape the outside to your desired design. Use a shear cut back and forth to eliminate any flat spots. Sand to satisfaction. Remount on one of the two screw chuck holes. 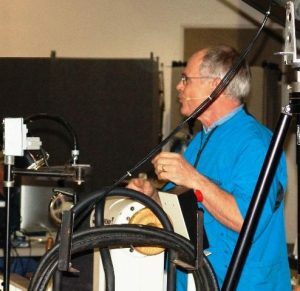 (remember you are now offset turning and you need to SLOW the lathe speed down initially and also assure tool rest clearance). You may need to use a shim spacer(s) between the screw and your piece to assure the screw does not go too deep. You can now remount to the second pre-drilled screw chuck hole and do the same to your desired design. Reverse jam to get rid of all screw holes. Following the above, create a center recess with your forstner bit. Also create a, say, 1/8” disc that will be of the size to fit into your center recess. However, sand down this disc on one side. 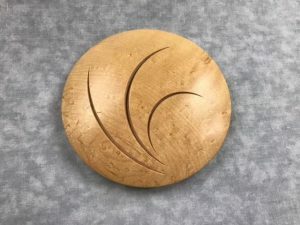 After turning the shape of your piece from the first center recess, insert the disc, mark with a pencil where you want your arc embellishment and then using your point tool cut in the arcs of your choice. Take piece off jaws, slide the disc to a desired location in the original center recess until the selected angle satisfies your desired design. Mark off the intended arcs with a pencil and then cut in the arcs with your point tool. You can experiment with additional resetting of the disc, created different designed cut arcs. Joe then applies a few coats of black Gesso (sanding to smooth out before second coat). Spray with catalyzed lacquer, applying a few coats, cutting back after the first or second coat. Now apply an acrylic color of your choice, working in the color to the cut arc with a Q tip. Wipe off excess with denatured alcohol. Apply one last coat of acrylic lacquer. After the piece has dried, reverse on a padded jam chuck to clean up the bottom. Use the wood of your choice and/or glue ups of contrasting woods. Your intended finished piece should start with a 1/4” thickness. Sand flat the back of the blank to 400 grit. Create a wood chuck, using double sided tape to fasten your piece to the chuck. Turn up speed and using a push cut towards the headstock, shape your piece to desired design. Sand to 400 grit plus. Apply 2-3 coats of medium CA glue sanding between each coat. Wet sand smooth and apply a few coats of catalyzed lacquer. Thanks to Alan Wasserman for writing Demonstration Summary and Joe Ruminski & Tina Collison for providing photos.